I remember an Alaska fishing trip where my group was flown into the headwaters of a remote river and floated for 10 days. We were totally self-sustained and had planned for every contingency; extra patch kits for the rafts, a robust first aid kit, satellite phone and MRE’s (Meals Ready To Eat) genuine military issue just in case the fishing was lousy or in case we ran out of real food I guess. About halfway through the trip, we realized we didn’t need the MRE’s and they were taking up space so we decided to forego a riverside lunch of freshly caught Dolly Varden and instead each of us grabbed a brown container and ripped it open. Some of us read the brief instructions, others knew just what to do recounting their military tour of duty where they lived off these for days on end. I tried to eat mine, macaroni and cheese I think. I have tried to block it from my memory. It was horrid. I lost my appetite for the remainder of the day. I ate a handful of mud to get the taste out of my mouth. Today’s dehydrated meals from Mountain House and Backpackers Pantry have come a long way since dad’s military issue MRE’s. 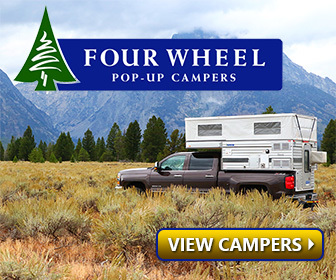 With an advertised shelf life of over 12 years, you can stock up on these and throw them in the camp box. 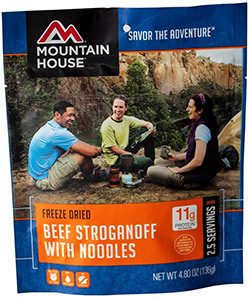 Mountain House makes a Beef Stroganoff that offers 2 ½ one cup servings. At about $10, it is a big bang for your buck. 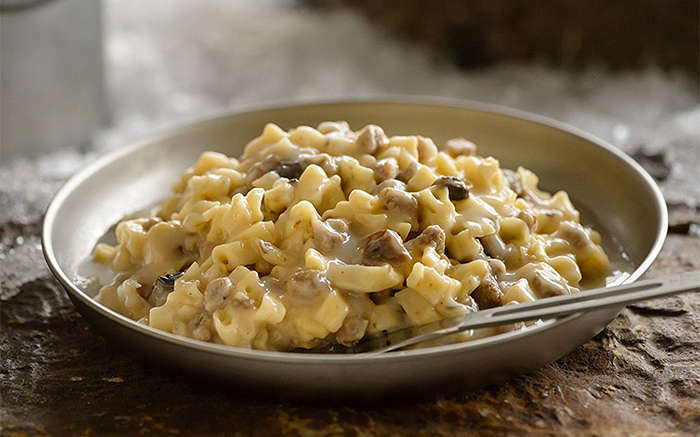 Beef stroganoff is not one of my favorite foods…so I gave Mountain House a test drive. It was great and is now a staple in my camp box and has a 30 year taste guarantee! 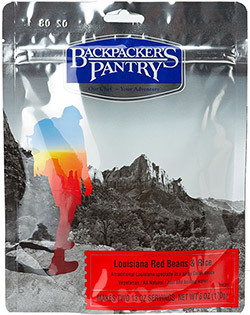 Backpacker’s Pantry offers a Louisiana Red Beans and Rice. I am a southern boy so I grabbed this off the shelf with a certain amount of nostalgia. While I wouldn’t pit it against the dinner plate of beans and rice at Commanders Palace in New Orleans, that is the most negative thing I can say about it. All I had to do was add hot water and wait a few minutes. It is a filling vegetarian power meal of two 13 ounce servings fit for after a carb burning hike to prepare you for the next day. All it needs is 2 ½ cups of boiling water and 13 minutes. 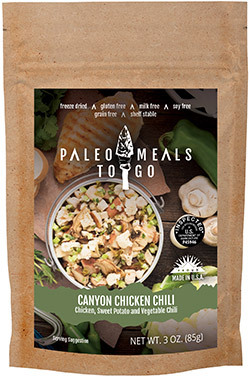 An alternative to Mountain House and Backpacker’s Pantry is Colorado Made Paleo Meals To Go. Paleo Meals To Go makes a gluten free Mountain Beef Stew packing 42 grams of protein. It comes with a sea salt packet for seasoning as desired. Paleo Meals has a 15 month shelf life. Paleo Meals To Go also makes Caldera Chicken Curry, Canyon Chicken Chilli and a few other options all for about $14. 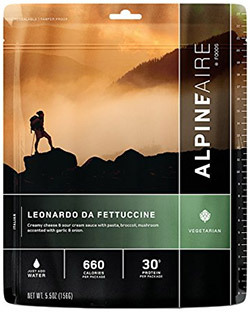 You might also want to try a lesser known line of meals made by Alpine Aire who offers such tasty titles as Wild Quinoa Pilaf and Leonardo de Fettuccini both for about $6. The creamy cheese and sour cream dish offers 30 grams of protein and 660 calories packed into a pouch with great reviews. Alpine Aire has over two dozen options. Wild Tyme Turkey cost a little more at just over $8 for 2 servings of 340 delicious calories and 38 grams of protein. If these options have too much additives, sodium or just don’t seem like they are fresh from mom’s cupboard there is another option if you have lots of time and no friends. 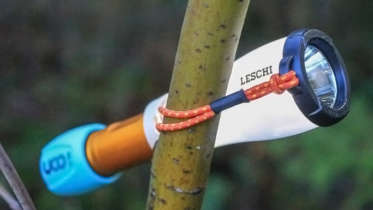 Check out backpackingchef.com for tips and tactics for transforming the way you eat on the trail. This site has information of choosing a dehydrator, preparing specific foods for dehydration and how to vacuum seal. Whatever choice you make, leave the brown bag military spec MRE’s to the troops with a wish they never have to actually eat them. May hot good food always be at your campsite. My advice is to get extra desserts. Some of the desserts like Crème Brule’ require only cold water and are absolutely wonderful. I keep Mountain House packages of Raspberry Crumble in the camp box. I can eat a packet of crumble at home anytime much less on the trail. A package contains four half cup servings and I can devour it all. Even the effort of digging out a packet and the jet boil is not enough of a deterrent to keep me from eating one of these now and then. Be the first to comment on "Instant Backpacking Cuisine – Dehydrated Meals Have Come a Long Way Since Dad’s Military issue MRE’s"